ut before that, here are two updates on global sea surface temperature (SST) anomaly, data as of this week. Notice the steep decline in SST in Nino region 4 -- near Indonesia, Philippines, other south east Asian countries. During the 2007-08 cooling, September 2007 SST anomaly (or deviation from the average) was around -0.4 C. As of September 12, 2010, the SST anomaly was around - 1.4 C. Meaning, current cooling of Nino 4 region is about 1.0 C colder than the already colder than usual mid to late 2007. 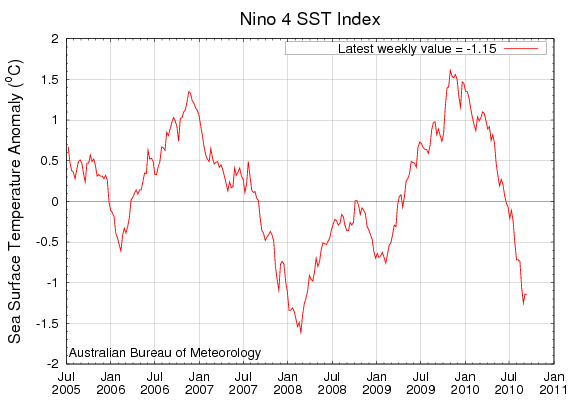 Data is from Australia's Bureau of Meteorology (BOM), http://www.bom.gov.au/climate/enso/indices.shtml. If by consensus, we mean "unanimity", then there really is no consensus. But is it reasonable to call the scientific opinion that warming is caused by human activities "religion"? An increasing body of observations gives a collective picture of a warming world and other changes in the climate system... There is new and stronger evidence that most of the warming observed over the last 50 years is attributable to human activities. Real science, unlike political science, is very strict: theory and data must conform with each other at all times. If theory conflicts with data, theory must give way, data should prevail. The previous theory reverts to become a mere hypothesis, to be subjected to a battery of more tests, to see if the previous theory holds or it should be abandoned and thrown away. So many data that contradict the "unprecedented warming due to human carbon emission" claim by Al Gore and the IPCC. The existence of the medieval warm period (MWP), much warmer than past century's warming (roughly from 1850 to 1998) was written by several hundred peer-reviewed authors and articles. If the IPCC authors are so confident of their findings, why were they all cowards to confront the several hundred scientists who presented papers in the International Conference on Climate Change (ICCC) the past 3 years? The 1st and 2nd ICCC were held in NYC itself where the UN holds office. IPCC should have sent 20 or 200 of its scientists to debate squarely with the contrarian scientists who blatantly organize an international forum in NYC itself that attempts to discredit most or all of what they wrote. But none, zero soul from IPCC authors. Why are they ALL so "busy" or coward? When a so-called theory contradicts with data, and since data must prevail over theory, and people still believe in that "theory", then it can be considered as a religion. In religion, you don't need much data and scientific facts. You only need to believe, you only need faith, and that's it. There was a MWP, but people say "No, there was no MWP, the past warming was unprecedented." That's religion. There is a climate cycle of warming-cooling-warming-cooling in the past 10,000 yrs, past 1 million yrs, etc. But people say "No, the world's temp was generally flat, until the industrial revolution came and created unprecedented warming." That's religion. Disregard facts, let faith prevail. Religion. I don't know that AGW theory has already been refuted. Surely, not by ICCC scientists, since the IPCC scientists did not attend their conferences to debate about the "new data" they have found? Regarding MWP and climate cycle of warming-cooling-warming, I don't think climate scientists are refuting that; only that the level of C02 concentration today is much higher than in those times and is the most likely cause of present-day warming (as Hyungsik pointed out in his post). By the way, many non-scientists like myself form our opinions and beliefs (or embrace a religion as you prefer to call it) by looking at websites like this: http://www.bis.gov.uk/go-science/climatescience/human-activities. So, it maybe better if you can put up a blog that refutes their arguments and counterarguments one by one for the benefit of the public. The only problem, I think, is that if people read your website and accept the counter-theory you are proposing based on the data and interpretations you have presented, nothing can stop climate scientists who are advancing the AGW theory from claiming that they have data and interpretations that refute your claims. And it is then that people turn to scientists with the strongest claims to legitimacy to help them form their opinions and beliefs. Thus, ironically, scientists become proponents of a new "religion" in a world where people are asked to decide/vote on policies that will determine the future of the human polity. Science can wait for "certainty", but politics is doomed to take action in the midst of "uncertainty" and conflicting values, beliefs and opinions, in a social climate that is forever changing. When Einstein's theory of relativity was still being questioned then, he said something like this: "They said there are 1,000 scientists who say I'm wrong. I don't need 1,000 other scientists to prove that I'm wrong. I only need one to prove that I'm wrong." The MWP existence is not a "new" data. It's old data, some scientists have written about it in peer-reviewed journals 50 yrs ago or older. So far, there are 879 different scientists from 522 diff research institutions around the world who wrote about the truthfulness of the MWP, http://www.co2science.org/data/mwp/scientists.php. But the AGW religion explicitly or implicitly say it never happened because the recent warming has zero precedent, it is "unprecedented." On this count alone, AGW is totally discredited already. Plus there are many other theories to explain the Earth's warming-cooling cycle in the past and the present. It was cited above, the IPCC Jan. 2001 report -- that's the 3rd Assessment Report or AR3. The most prominent graph in AR3 was the "hockey stick" shape made by Michael Mann of Pennsylvania State U. That graph shows a generally flat world temp over the past 1,000 years -- no MWP, no little ice age (LIA) -- until about 1850s, CO2 and world temp rose rapidly up to the present. The graph looks like a hockey stick. Lots of scandal generated by that graph, more appropriately called "Mann-made warming" to refer to its author, Michael Mann. Now, go to IPCC AR4 released in November 2007. That graph is gone, no traces. No explanation whatever given by AR4 why the most prominent graph of AR3 is gone. The theory of gravity has zero skeptic, because data and theory always conform with each other. No one jumped from a building or an airplane without a parachute just to disprove that theory, everyone knows that theory is true. Many other scientific theories have zero skeptic or contrarians because facts always conform with theory. In AGW or man-made warming religion, the number of skeptical voices is directly related to the number of contrary facts. If we go by Eisntein;s advice, just one -- not 100, not 1,000, only one -- contrary data and AGW is already discredited. Only politics and evil desire for global ecological central planning keeps it alive.